That is the tactic the Southington girls volleyball team uses when it’s falling behind, but in this case fallen. 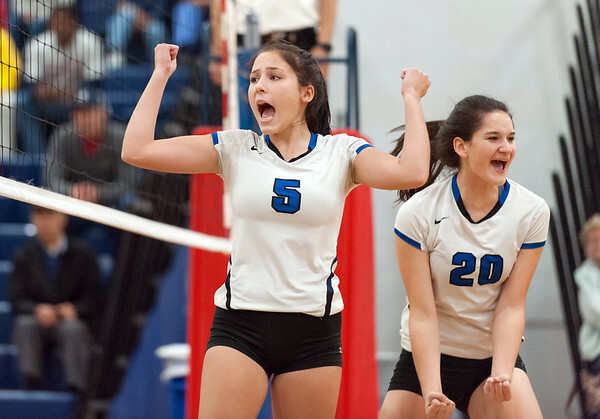 The Blue Knights (18-1) suffered their first loss of the season, a 3-2 upset, in the second round of the CCC Tournament Tuesday evening against No. 8 Farmington. Southington finished its regular season, completely undefeated, something the team hasn’t done since 2004. From the years 2008-11, the Blue Knights posted 17-1 records, claiming the Class LL title in 2009 and were runners up in 2011. Some would think with such a remarkable record, comes the pressure to be perfect and to win every game. But the girls didn’t think that way. After the loss, Southington will be planning on using the next couple days to prepare for the larger task at hand, the Class LL Tournament. Like Heitz said, Southington was up 2-0 going into the third set but once the fatigue kicked in one could tell the Blue Knights were losing energy. Servicy passing was one of the underlying reasons why Southington was doing so well this season. The team can now break down the mistakes to make sure they don’t recur during the tournament. Southington is still currently ranked in the top spot and will most likely receive a bye for the first round. Posted in New Britain Herald, Southington on Wednesday, 31 October 2018 21:12. Updated: Thursday, 1 November 2018 15:44.